I’m not big into using machines at the gym. I definitely prefer free weights — you know, barbells, dumbbells, and kettlebells, oh my! There’s something I just really love about my body having the responsibility of stabilizing and moving the weight along a specific path rather than letting a machine do it. Mostly, I suppose, because this mimics life and the sports I enjoy participating in. But there is one machine that I use frequently — the cable machine. It’s a machine that look like a big tower with a pulley system in the center, and has adjustable weights and interchangeable handles. Perhaps you’ve seen it and are familiar … and maybe a little intimidated, because, it’s true, there’s a lot going on there. But that’s one of the things I love about it most. There are all these options for pulling movements on multiple planes that are just not possible with free weights. In other words, this machine can fill in the strength gaps and teach your body to work well in a whole new way. 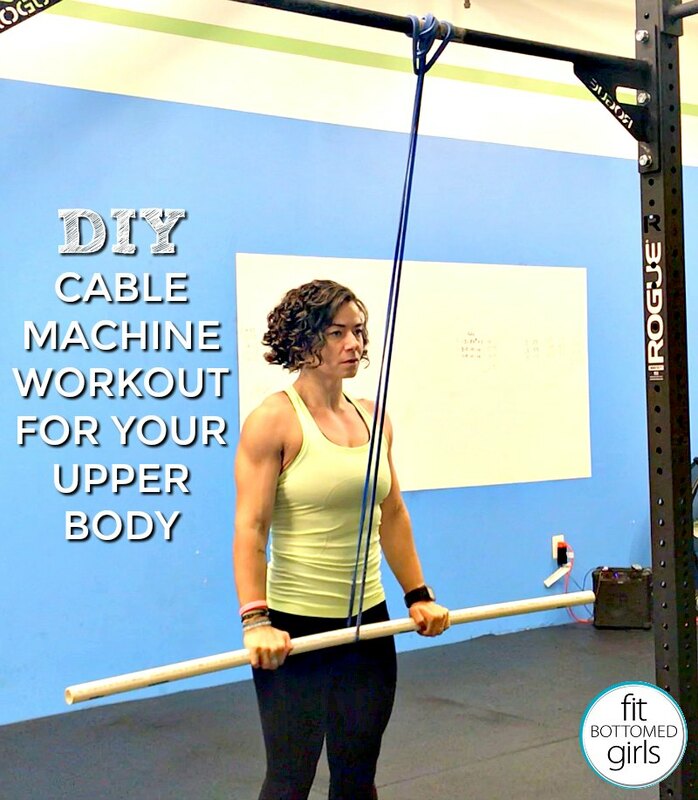 The cable machine incorporates many of the same benefits that I love about training with free weights: (a) it requires both sides of your body have to work together to move the machine’s handle through space, (b) the path that the handle travels is determined by you (not the machine’s guide rails), and (c) it still activates your stabilizer muscles quite a bit. But let’s face it — this machine is expensive, so not all gyms have one, and many of my clients don’t have access to a cable machine. So, being the resourceful athlete and coach that I am, I found away around that problem. To employ my solution, you only need a long, thin (½”-¾”) resistance band and long, sturdy dowel or piece of PVC pipe. Anchor these two simple items to anything stable (although, as you’ll see in the video below, having the ability to secure it at various heights will give you a lot more flexibility when it comes to the different exercises you can do) and you’ve got yourself a DIY Cable Machine — all for the bargain price of about $15. I’m a fitness MacGyver. One of the coolest things about this setup is that, unlike the gym’s cable machine, the resistance this setup provides is not consistent, it’s variable. The means that the further you stretch the band away from its anchor point, the more resistance you feel and therefore the harder it gets. So you’ll really have to work for that end range of motion. And while you might not like that during your workout, over time your posture will improve dramatically. Okay, so now that you’ve got this awesome setup, let me show you what you can do with it. Here are six of my faves for your upper body. Aim for 3-4 sets of 10 reps for each move, and be sure to position your body far enough away from the anchor point of the band to make tough to maintain the full range of motion for the last two reps of each set. Check out this video for a demonstration of each of these exercises.